1. Place the Couscous in a large bowl and add the seasoning, Oil and boiling Water. 2. Cover with cling-film and set aside. 3. Heat the rest of the Oil in a large frying pan and add the Black Tiger Prawns and season with Coriander. Cook until they turn pink in colour. 4. Meanwhile, ensure the Couscous is fluffy; if not use a fork to create a fluffy texture. 5. 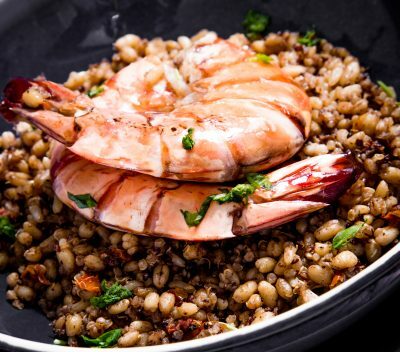 Place the Black Tiger Prawns on top and add Parsley to garnish.